February 14, 1940. The Rochester newspapers were filled with the ominous events that would soon lead America into war. Closer to home, the winter’s worst snowstorm snarled traffic and closed schools. Yet for MAG, it was a very bright day indeed, as the Gallery’s Women’s Council held its first meeting. Like so much at the Gallery, the Council’s beginnings were inextricably linked with the Herdle family. The all-volunteer group was the brainchild of the Gallery’s director, Gertrude Herdle Moore, and both she and her sister, curator emeritus Isabel Herdle, were among the “founding mothers” present at that first meeting. 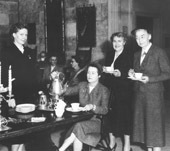 Pictured at left: In 1955, director Moore (second from left) enjoys tea in the Fountain Council with fellow Council members. The Council’s first major fundraiser was a 1942 exhibition of the Thorne collection of miniature rooms, first seen at the New York World’s Fair of 1939. Some 19,000 people visited, netting the then-spectacular amount of $1,500. During seven decades, the group has raised over three million dollars for the Gallery, its collections and its programs. Over the years, the Council has raised money through galas ranging from April in Paris (1956) to the Tapestry Ball (1996), Art in Bloom, Just Jazz, Third Thursdays, and Collections and Cuisines. For several decades starting in 1962, the biggest money-maker was the Gallery’s annual Clothesline Festival. Hundreds of volunteers each year were involved in food concessions, an activity the Council continues to this day. Other ongoing projects include the Council’s yearly Art and Treasures next-to-new sale, fall Fine Craft Show and Sale, and art tours at home and abroad. In the past two decades the organization has undergone significant changes. No longer the Women’s Council, it officially changed its name to the Gallery Council in 1994, three years after welcoming its first male members. Then in 2007 the Council held a series of focus groups moderated by a management consultant. The findings were used to identify goals for the future and develop a strategic plan, which with periodic updates continues to guide the Council. Some things remain constant, however. Unlike many other volunteer organizations, the Council still requires that members contribute their time. But members also reap the rewards, notably a sense of commitment and a sense of belonging. And even though members are far more likely to work outside of the home, their numbers, at more than 300, have more than tripled since 1955. It’s a debt the Council has been quick to repay. One of the first things Laura Swett, 2000–02 Council president, instituted during her tenure was an annual reception for “the incredible MAG staff, in recognition of their dedication and service.” Together, the Gallery and the Gallery Council look forward to the next 75 years.